When you take part in our online paid surveys it's not just you that gets rewarded. Part of what makes OpinionWorld unique is that we will make a donation to charity after every online poll that you complete. It's completely free and costs you nothing - we will award you points as your reward, and you can decide which charity receives a cash reward from us on your behalf. Earning money online whilst supporting a good cause has never been easier. The three charities that OpinionWorld works with are CONCERN Worldwide, Leukaemia & Lymphoma Research and World Animal Protection. Each of these worthwhile causes rely on charitable donations in order to keep going. OpinionWorld will make a donation on your behalf to your preferred charity after every paid survey, and we will ask you where you would like our donation to go to at the end of each online survey that you complete. To find out more about each charity please see below. 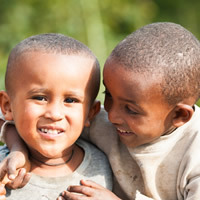 CONCERN Worldwide are dedicated to working towards a world without poverty. They help some of the world's poorest people and aim to tackle hunger and transform lives through supporting communities in crisis and offering practical solutions to make a difference. CONCERN offer education programmes, offer aid in the event of natural disasters, provide food and medicine to reduce malnourishment and the spread of disease, and support livelihoods to encourage self-sustainability for a better future. Bloodwise are the UK’s biggest blood cancer charity and they’re here to beat blood cancer. They stop people dying from blood cancer, they make patients’ lives better and they stop people getting blood cancer in the first place. For over 55 years they have funded vital research into blood cancer, and provide support and information for patients and their families. Bloodwise won’t stop until every single person survives and can live their life to the full, but they can’t do it without your support.